Monica Baskin, Ph.D., professor at the University of Alabama at Birmingham Division of Preventive Medicine, was recently installed as president of Jefferson County Health Action Partnership. The Partnership is a community health-oriented collaboration of more than 80 organizations, including the United Way of Central Alabama, Jefferson County Department of Health, UAB and Community Foundation of Greater Birmingham. Achievements of the Jefferson County Health Action Partnership include comprehensive smoke-free policies throughout the county; 41 miles of fully funded or completed bike and pedestrian pathways; increases in fresh fruit and vegetable purchases by Supplemental Nutrition Assistance Program, or SNAP, recipients by 60 percent; and nutrition education, workshops and equipment for physical activity in 12 Jefferson County school systems. The partnership’s current priority areas include promoting physical well-being through healthy lifestyles, improving mental health, optimizing the built environment, reducing health disparities associated with race, ethnicity and economics, and optimizing health care access. Health Action partners work together around these shared objectives and strategize to improve community health through changes to policies, systems and environment. Baskin also serves as associate director for Community Outreach and Engagement at the O’Neal Comprehensive Cancer Center at UAB. The O’Neal Comprehensive Cancer Center at UABpresents Lace Up for a Cure, an annual 5K walk to be held Saturday, March 9, at the UAB Campus Green located on Ninth Avenue South in Birmingham, Alabama. Lace Up for a Cure will benefit the O’Neal Comprehensive Cancer Center and aims to bring together individuals from the community who have been impacted by cancer. Registration is $15 online. The Cancer Center was recently renamed the O’Neal Comprehensive Cancer Center at UAB with a generous naming gift of $30 million from O’Neal Industries and its shareholders. The O’Neal Cancer Center is the only National Cancer Institute-designated comprehensive cancer center located in the four-state area that includes Alabama, Mississippi, Louisiana and Arkansas. With its array of clinical trials, precision oncology efforts and continued commitment to outreach efforts in cancer disparities, it is at the forefront of improving cancer prevention, diagnosis and treatment. “We want to make a meaningful difference in the fight against cancer, and we couldn’t do it without community support,” Birrer said. The event will feature fun for all ages, an event T-shirt for purchase, yoga dance by Meg Baker and music by DiJital Entertainment. Smoothies and açai bowls will be available for purchase from City Bowls, and Southern fare will be sold by Shindigs. Registration is $15 online and available on-site for $20. The 5K walk route can be viewed on the website. Free parking will be available in the UAB Ninth Avenue Deck located at 1602 Ninth Avenue South, Birmingham, AL 35205. The Ninth Avenue Deck is conveniently located steps away from the UAB Campus Green. UAB Women’s Basketball, in collaboration with the O’Neal Comprehensive Cancer Center at UAB, is going pink to increase awareness for the fight against breast cancer. 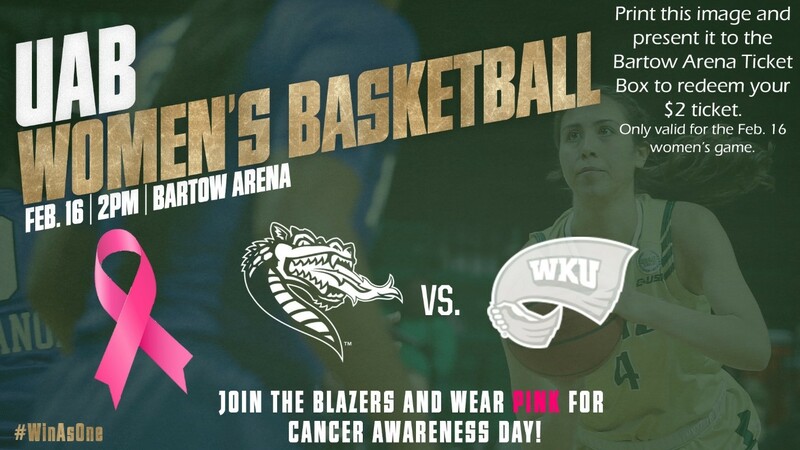 On Saturday, Feb. 16, at 2 p.m., UAB will play Western Kentucky at Bartow Arena, 617 13th Street, Birmingham. Tickets are $2 for current cancer fighters, survivors and their families, and all UAB employees. Along with discounted tickets, pink infinity scarves will be given to the first 300 fans through the doors. Breast cancer fighters and survivors will be honored on the court during halftime. Survivors are especially encouraged to attend and take part in this annual event. Attendees are encouraged to wear pink and show their support. Please RSVP with first and last names to sportspromo@uab.edu by Feb. 14 to take part in the halftime presentation. To get the discounted tickets, print this image and bring it with you to the Bartow Arena Ticket Office from Monday-Friday from 9 a.m.-5 p.m. or two hours before tip-off Feb. 16. The naming and gift will be formally considered for acceptance by the University of Alabama System Board of Trustees at its February meeting. Click here to open image for printing. Emma is on her way. By ship. By specialized truck. And by crane. Emma is the cyclotron destined for the new University at Alabama at Birmingham Proton Therapy Center. A cyclotron is the central piece of precision equipment that will deliver cancer-treating proton therapy at the UAB center. The center, owned by Proton International, a leader in the field of proton therapy, is currently under construction on the UAB campus. Emma, who was built in Germany by Varian, a longtime partner with UAB in delivering radiation therapy, weighs about 180,000 pounds and is a $25 million investment. Getting her to UAB is a complicated task. She departed Zeebrugge, Belgium, on Feb. 3 aboard the vehicle carrier MV Tugela. The website www.marinetraffic.com can be used to track her progress. The Atlantic Ocean crossing will take about 10-15 days. She will off-load at the Georgia Ports Authority facility in Brunswick, Georgia. She will then be loaded onto a specialized truck, with 20 axles, 78 wheels and two drivers — one in the cab and one in back, as in a fire department ladder truck — for the road journey to Birmingham. The truck, which can carry 300,000 pounds, is articulated in six sections, meaning it can turn at multiple points to navigate narrow roadways. It will be a slow journey, with an average speed of around 17 miles per hour. A specialized crane, capable of lifting Emma, will be constructed at the site of the UAB Proton Therapy Center, Fourth Avenue South at 20th Street. The target date for lifting Emma and lowering her through the roof of the mostly completed facility is Feb. 28. Following a year of tests and calibration, UAB anticipates opening the facility in spring 2020. The UAB Department of Radiation Oncology will use Emma to deliver highly precise proton beams instead of traditional X-rays to attack tumors. Proton therapy is available at only 25 locations in the United States, most associated with academic medical centers. Proton therapy is used to treat tumors of the brain and central nervous system, spine, head and neck, lung, prostate, liver, and gastrointestinal tract and colon, and some breast tumors. UAB will provide updates throughout February on Emma’s progress. The Breast Cancer Research Foundation of Alabama presented its largest donation ever of $1 million to the O’Neal Comprehensive Cancer Center at the University of Alabama at Birmingham. Since its inception in 1996, the BCRFA has made an annual donation to research with proceeds from all of its fund-raising efforts during the prior year, including sales of a special breast cancer research license plate, BCRFA events, and individual and community support. This year’s contribution brings the Birmingham-based organization’s cumulative total for breast cancer research at UAB to more than $8.7 million. BCRFA’s funding has provided the seed money for many projects to get off the ground. For example, diabetes is associated with poor breast cancer prognosis and a higher mortality rate than in non-diabetics. Lalita Samant, Ph.D., professor in the UAB School of Medicine’s Department of Pathology and associate director of Education and Training at the O’Neal Cancer Center, has been investigating the hyperglycemic state of triple negative breast cancers. Triple negative cancer cells have been shown to be more aggressive and capable of suppressing the immune system, preventing it from recognizing and killing the cancer cells. With BCRFA funding, Samant and her team will now examine whether combining a diabetes drug with a treatment that targets triple negative breast cancer cells will improve outcomes. This study will likely lead to a clinical trial for diabetic triple negative breast cancer patients. Other projects range from evaluating new vitamin A-related molecules to develop drugs for preventing breast cancer to research that will focus on improving the long-term effects of cancer therapies on breast cancer survivors. Community support during 2018 included 20 Alabama fire departments that participated in the Pink Ribbon Project, selling T-shirts during October to raise funds and awareness, along with dozens of other businesses, schools, churches and individuals who used grassroots fundraising to raise money for breast cancer research. About half the total donation was also raised through the BCRFA specialty car tag sales, with 100 percent of funds going toward research. Several corporate and community partners of BCRFA include Tameron Automotive, The Thompson Family Foundation, Sirote & Permutt, The Alabama Power Foundation, Renasant Bank, Wind Creek Wetumpka, Protective Life Foundation, Thrivent Financial, Spectrum Reach, and iHeart Media, among many others. The BCRFA supports a comprehensive approach to battling breast cancer through collaborative partnerships and innovative research. All BCRFA donations remain in Alabama to support research at the O’Neal Cancer Center. “Patients come to the Cancer Center because they can be seen by clinical breast cancer experts and receive ‘cutting-edge’ therapies based upon our phenomenal breast cancer research program,” Birrer said. The naming of the O’Neal Comprehensive Cancer Center at UAB will be formally considered for acceptance by the University of Alabama System Board of Trustees at its February meeting. In an article recently published in JCI Insight, researchers from the University of Alabama at Birmingham and Vanderbilt University have identified checkpoint inhibitor resistance mechanisms in many solid tumor cancers, including melanoma, lung cancer and breast cancer. Randall S. Davis, M.D., professor in the University of Alabama at Birmingham Division of Hematology and Oncology and senior scientist in the O’Neal Comprehensive Cancer Center, served as the paper’s co-senior author. Checkpoint inhibitors are a type of drug that patients with cancer can take to help block proteins made by certain immune system cells, such as T cells. In the normal body, the proteins help keep the immune system in check; but also, they keep T cells from attacking cancer cells that a person may have developed. CI drugs block these proteins, enabling T cells to fight cancer more effectively. However, with patients’ living longer, tumors are able to evade the therapy and alter their gene expression, ultimately tricking a person’s immune system and checkpoint inhibitors from responding and attacking cancerous cells. The published research looked at patients who had relapsed after a checkpoint inhibitor course of treatment. In the study, Davis and his team sought to determine how certain expression patterns on tumor cells could give physicians an idea of whether the patient’s immune system would not respond to checkpoint inhibitors, ultimately causing a lack of response when fighting off cancerous cells. In fact, a receptor co-discovered by the team several years ago — FCRL6 — may serve as a new checkpoint target in these patients, identifying it as a potential immunotherapy option in the future. Survivors of childhood Hodgkin lymphoma are at an increased risk of developing an entirely new cancer later in life, according to new research published in Cancer — the American Cancer Society’s international peer-reviewed scientific journal — and conducted at University of Alabama at Birmingham. While previous studies on childhood survivors have indicated this increased risk, none have explored the nature of cancer risk beyond 25 years post-diagnosis, says Smita Bhatia, M.D., director of the Institute for Cancer Outcomes and Survivorship and lead author of the paper. This study extends the follow-up of the Late Effects Study Group (LESG) cohort, which was first established in 1979. The researchers followed up with more than 1,000 former patients with childhood Hodgkin lymphoma (HL) for an average of 26.6 years. They found that survivors are at increased risk of developing subsequent malignant neoplasms (SMNs), or cancerous tumors. The survivors of HL were approximately 14 times more likely than the general population to develop a second different cancer, such as breast, colorectal, lung or thyroid. The risk of any solid second cancer was at 26.4 percent 40 years after HL diagnosis. The study also identified high-risk populations within HL survivors. For example, girls with HL who were between the ages of 10 and 17 when receiving chest radiation therapy were at the highest risk for developing breast cancer, while boys who received chest radiation when they were less than 10 years old were at highest risk for lung cancer. In these high-risk groups, the incidence of breast cancer was 45.3 percent, thyroid cancer was 17 percent, colorectal cancer was 9.5 percent, and lung cancer was 4.2 percent by the age of 50. In the care of survivors and future patients, Bhatia and her colleagues emphasized the importance of screening in early detection of cancer. The study’s goal was to establish evidence for further screening recommendations for individuals, such as which HL survivors in particular would benefit the most from screening or the time for screening initiation and the ages where screening is no longer necessary. “We need to identify high-risk subgroups to find which specific populations are in critical need of additional screenings and long-term follow-up,” Bhatia noted. Members of the Head and Neck Oncology Program at the University of Alabama at Birmingham will offer several opportunities for head and neck cancer patients, survivors and family members to discuss problems for those affected. Seamon says new cancer patients are often overwhelmed with lots of information and appointments in addition to a whirlwind of emotions. Head and neck cancers account for approximately 4 percent of all cancers in the United States. These cancers are more than twice as common among men as they are among women. Head and neck cancers are also diagnosed more often among people older than age 50 than they are among younger people. Specialists from the Department of Otolaryngology, Department of Oral and Maxillofacial Surgery, Division of Radiation Oncology, and Division of Hematology and Oncology will be on hand to provide answers and support. Each support group meeting will focus on a different topic of discussion provided by UAB experts. The event is held the third Thursday of every other month at 4 p.m. at 1824 Sixth Ave. South in Room NP2532. Free valet parking for attendees is available at the Hazelrig-Salter Radiation Oncology Center at 1700 Sixth Ave. S. The first meeting of the year is Thursday, Jan. 17. No RSVP is required. Artists will create spectacular works of art in the blink of an eye during the O’Neal Comprehensive Cancer Center’s 34th annual ArtBLINK Gala at 6:30 p.m. Saturday, Feb. 2, in The Kirklin Clinic of UAB Hospital, located at 2000 Sixth Ave. South. As one of Birmingham’s premier events, the elegant evening features local artists who create masterpieces in 90 minutes, a silent auction, artists gallery, cocktail dinner provided by IZ Catering, and a night of dancing with live music from The Schmohawks. Funds from the Gala go toward the Cancer Center’s Fund for Excellence, which supports high-priority research efforts including launching young investigators in cancer research or recruiting new faculty. Often referred to as Alabama’s cancer center, the O’Neal Comprehensive Cancer Center at UAB is a national leader in research and treatment. Its comprehensive designation, awarded by the National Cancer Institute, is held by only 49 institutions in the country. UAB’s cancer center was one of the first eight comprehensive cancer centers in the United States and has held this designation continuously for the past 45 years. Local artists include Ginnard Archibald and Joseph Longoria, Ahmad Austin, Melissa Payne Baker, Pam Benoit, Sally Waldrup Boyd, Gary Chapman, Joan Curtis, Vicki Denaburg, Lynthia Edwards, Thomas Findlay, Gina Hurry, Carrie Pittman, Linda Ellen Price, Michael Swann, Sherri Van Pelt, Paul Ware, Sarah Soule Webb, Robine Wright and Natalie Russo Zoghby. Admission is $150 per person. For more information, visit www.artblink.org. Purchase tickets online, or call 205-934-1603. Dress is black-tie-optional. Valet service and deck parking are available for guests. Presenting partners include AutoTec, O’Neal Industries, Protective Life Corporation and Regions Bank.